It's me again checking in with my weekly update. I hope all are well and dealing with this heat wave that won't end. If you live someplace where that isn't a issue, then the rest of us are mighty jealous of your location! I myself am doing good, except for my complextion keeps getting darker with every passsing day I bake in the sun. If it ain't bad enough working in 114 degrees outside for most of the week, only breaking down on the way home, could've been worst, and that is exactly what happend last Tueasday evening. My helper Mike and I were riding home in my old 67' Ford truck, loaded with debris, when I smelled fire and saw smoke coming out of the hood vents. I pulled over immediatly and opened the hood and saw the carburetor on fire! "Holy crap," I thought, as I tired to remove the fliter cover and expose the carb so I could douse the flames. I mangaed to lift the heavy metal housing, but not before scorching my arm a bit. Mike and I threw every drop of water we had on us and even tossed our frozen fruit drinks we were sipping on. We finally put the fire out as the traffic zoomed by in a hurry to get home and out of the blazing heat. Luckly we were not on the freeway, but on a side road with a lot less traffic and congestion. I was afriad it might explode for a few frightful seconds, and fortunately I lived to tell you that it did not. 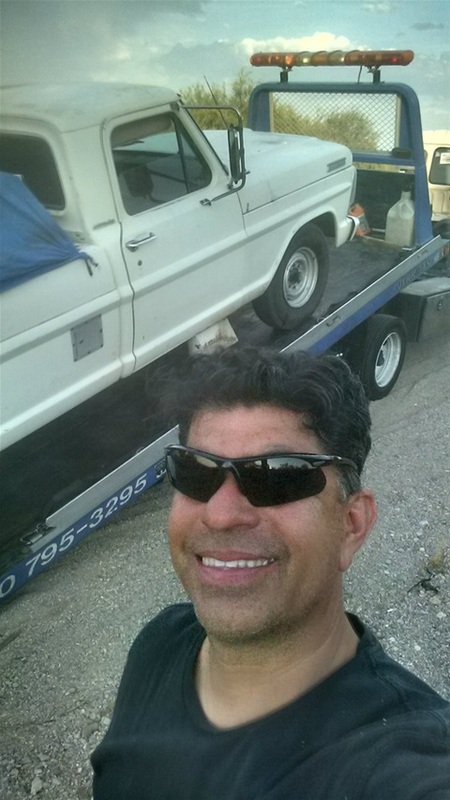 I had to call a truck to tow us and my sick baby home, but we had to wait quite a while for our turn, as the heatwave created tons of stalled automobiles and flat tires. I took it all in stride, becuase after drivings for months on my tour, I realized that breaking down at here is better than breaking down hundreds or thousands of miles away from home. I was happy that it wasn't much more than an inconvenience for a couple of hours. I have recently wrote you about my physical condition since my return from the road and how the doctor suggested I lose 25 pouds or so. At first I couldn't see it, but now after six weeks of good rest and nutrition, for the most part, I still don't feel 100%. So I decided to get serious about losing those extra pounds, especially since I'm spending alot more time sitting behind the laptop writing my book. The thing is, I saw a movie on Netflixs called 'What the Health' and it inspired me to make a few changes in my own personal life, mostly with my dietary habits. Without going into too much detail, the movie explains the concept of a meatless diet, primarily processed meats, as an alternative to a traditional low fat, sugar and carb program. basically just eating plants as an alternative protien source. Now as you know, I, being a former butcher for many a years, truly enjoy eating meat of all varieties, especially beef and pork, but this documentry really opened my eyes to many of the behind the scene studies and dealings with the very institutions that are supposed to be watching over our heath. I'll leave it at that for now, but I will recommend the movie to anyone who struggles with health and diet issues. I worked for many years in the grocery world before I became a traveling hanyman, so I believed, and totally understood many of the points that were made when it came to the risks associated with processed foods of all kinds, especially in this country. Meanwhile, I'm going to give up meat and dairy products for a couple of weeks and let you know how it works for the Johnny Man, and my 25 lbs. weight loss goal. Well friends, so long, thats all for tonight. Stay cool and in touch and thanks for checking in!